Certain vital patterns can be seen in the chemical conduct of group 13 elements. The trichlorides, iodides as well as bromides of every one of these elements being covalent in nature are hydrolyzed in water. Species like tetrahedral [M(OH)4]- and octahedral [M(OH)6]3+ with the exception of boron exist in fluid medium. The monomeric trihalides, being electron lacking, are strong Lewis acids. Boron trifluoride effortlessly react with Lewis bases, for example, NH3 to finish octet around boron. It is because of the nonattendance of d-orbitals that the greatest covalence of B is 4. Since the d-orbitals are accessible with Al and different elements, the most extreme covalency can be normal past 4. A large portion of other metal halides (e.g., AlCl3) are dimerized through halide bridging (e.g., Al2Cl6). The metal species finishes its octet with the help of electrons accepted from halogen in these halogen bridged particles. Though aluminum is a metal, Boron is a non-metal. 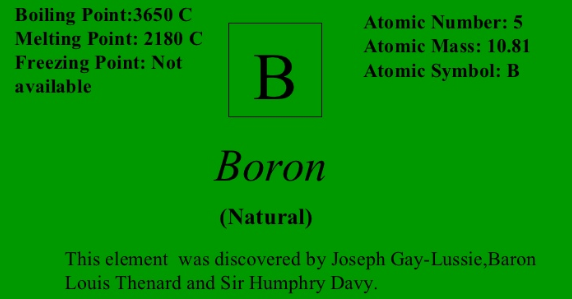 Aluminium is a good conductor of electricity but Boron is not. 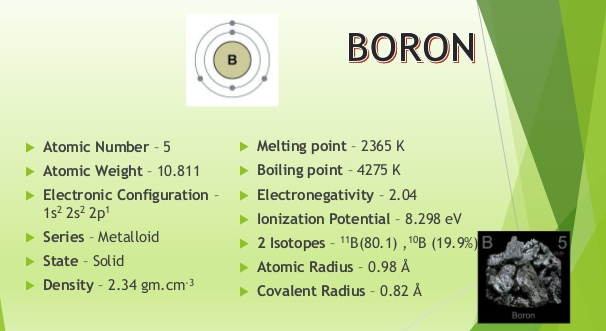 Boron exists in two structures amorphous and crystalline. Aluminum is a delicate metal and does not exist in various structures. The boiling point and melting point of boron are much higher as compared to those of aluminum. Boron frames just covalent compounds while aluminum shapes even some ionic compounds. The oxides and hydroxides of boron are acidic in nature though those of aluminum are amphoteric. The trihalides of boron (BX3) are monomers whereas, aluminum halides subsists as dimers (Al2X6). The hydrides of boron are quite inert while those of aluminum are flimsy. Boron and Silicon show the distinctive properties of non-metals. These don't shape cations. Both exist in crystalline and amorphous structures. Boron Oxide (B2O3) and silica (SiO2) are both acidic and break up in solutions that are alkaline in nature to frame borates and silicates separately. Silicates and borates have tetrahedral SiO4 and BO4 auxiliary units individually. The chlorides of both Si and B get hydrolyzed by water to form respective silicic acid and boric acid. The hydrides of Boron and Silicon are very stable. Various unstable hydrides are additionally known which burst into flames on introduction to air and are effortlessly hydrolyzed. Both these elements are semiconductor by nature.